As of this writing, 34 states, encompassing over 84% of American women, now require some level of breast density reporting to a patient after her mammogram. In fact, only 6 states have not endeavored to address either density inform or education in some manner through legislation. Why does knowing my breast density matter? 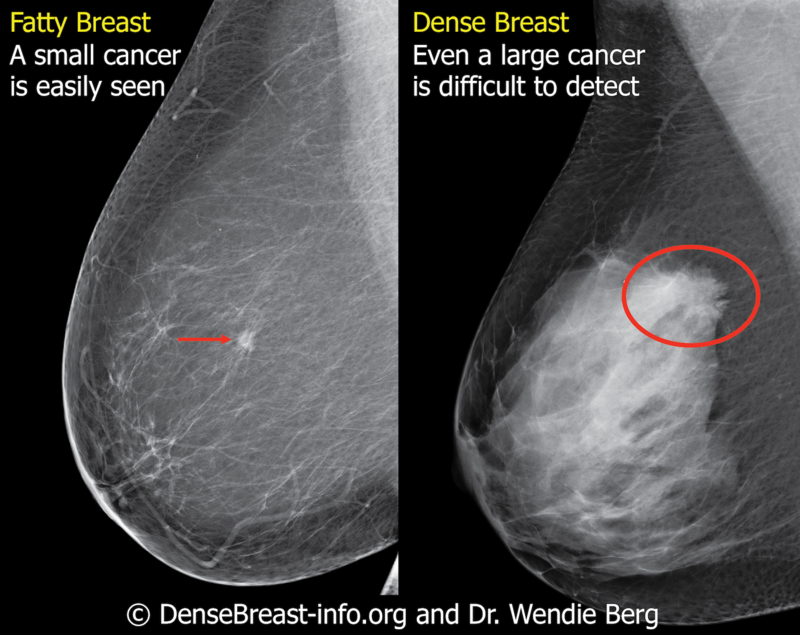 If you have dense breasts, a “normal” or “benign” mammogram report does not reliably exclude that cancer is growing undetected. Do all “inform” laws provide the same information? No. While the majority of states have enacted such laws, the laws vary and the existence of a law in your state does not necessarily mean you will be informed if you have dense breasts. There is no consistency from state to state on what the laws require women to be told about breast density. In fact, some density inform laws only require a woman be provided general information about breast density without providing her information as to whether she has dense breasts! Click here for an interactive map and learn what is required in your state. 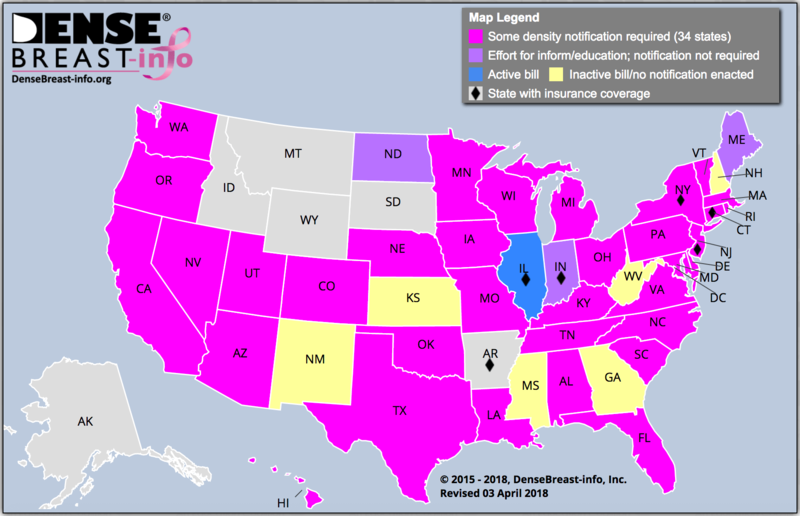 If you live in a state without an inform law, one which doesn't require you be informed if you have dense breasts, or want to learn your own breast density, check with your referring health care provider or the imaging facility that performed your mammogram. This information is usually included in the mammogram report sent from the imaging center to your referring health provider. What about a national standard for reporting density to all women? Because the laws vary from state to state, after work on my own state bill in New York, I initiated efforts on the federal level for a single national standard. A national reporting standard would mean all women in the U.S., no matter where they live, would receive the same level of information about their breast density. This can happen either through federal regulation or federal legislation and efforts have been initiated on both. On the federal legislative front, the Breast Density and Mammography Reporting Act of 2017 has been introduced in both the Senate (S 2006) and the House (HR 4122). On the federal regulatory level, the FDA anticipates issuing a Breast Density Reporting amendment to the Mammography Quality Standards Act (MQSA) as a “Notice of Proposed Rulemaking” in 2018. For more information on federal efforts, click HERE. For a comprehensive resource about breast density, including FAQs, please visit the “For Patients” tab on DenseBreast-info.org and for more information about the law, or legislative efforts for a law, in your state contact contact@dense-info.org. JoAnn Pushkin, Executive Director of DenseBreast-info.org, is a patient/advocate, author and speaker. Her initiative and advocacy served as inspiration for New York State's breast density inform law which went into effect in January 2013. On the federal level, Ms. Pushkin led the efforts for both the introduction of the Federal Breast Density and Mammography Reporting Act, as well as the FDA’s Mammography Quality Standards Act regulatory amendment consideration.